Gilbert Electric Co. Inc. is a full service electrical contracting company serving the Commercial and Industrial Industries of Southern Arizona. We have the capability of providing full electrical contracting services for: new construction, renovations, tenant improvements, service upgrades, design build projects, maintenance service, parking lot lighting, emergency generators, UPS systems, underground high and low voltage feeders, industrial controls, stadium lighting and lightning protection systems. 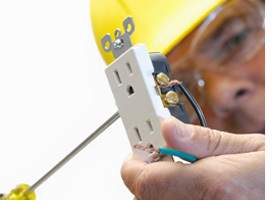 We also have experience in many specialty electrical fields including telescopes and astronomy facilities, remote installations, solar panels & controls, wiring & testing for high speed production machinery, hospital X-ray & MRI equipment, medical laboratories, electronic manufacturing, clean rooms and work stations, hazardous materials, areas, class I - Divisions I & 2, aircraft maintenance & retrofit facilities, ore processing plants & mining operations and protected installation in fuel and combustible areas. From design to finish, our experienced estimators, project managers and electricians provide the expertise to ensure your electrical project is completed on time, on budget and up to code. We understand that service interruptions are an inconvenience and cost you productivity so we focus on providing expedient services to get you back online as soon as possible without risking the safety of your valuable electrical equipment. We are also absolutely committed to safety and provide ongoing education to our personnel to ensure complete compliance all OSHA and MSHA safety standards. Gilbert Electric Co. Inc. has served its customers for over 35 years with a commitment to service and value. We have the experience and expertise to get the job done right the first time. We employ only highly skilled and drug free professional electricians and provide personalized service at affordable rates. Gilbert Electric Co., Inc. has been providing quality commercial and industrial construction services in Arizona since 1972. Based in Tucson, the Gilbert Electric management team offers a cumulative total of over 150 years experience in electrical construction and retrofit. Our licenses include L-11 (under 600 volts) and A-17 (over 600 volts). Gilbert is a signatory to current work agreements with locals of the IBEW. The company is fully insured and bonded. For over 30 years, we at Gilbert Electric, Inc. have worked to earn a reputation for quality, reliability, safety and cost-conscious performance of the widest possible scope of electrical construction contracts. We are proud of the fact that many of our customers and requests for proposals are repeat business. As in the past, we will continue to perform to the high standards that our customers have come to expect and deserve.